Login here to continue with your course. BUSINESS HOURS: Monday–Friday 9 a.m.–6 p.m. CST. Why does my lesson show up as incomplete? Do not use the Internet Explorer browser. Switch to a different browser. First try Mozilla Firefox. This is the best one to use if you are using an Android Phone or a tablet. If that doesn't work, switch to Google Chrome. Why is my progress not being saved? This is a technical error caused by how you hold your phone when you launch the lesson or click on the green play button. To fix this problem click on the button at the top of your phone screen that lets you view all tabs. Look for a tab labeled "Untitled," or "EZ Untitled," close this tab. Next you will need to turn your phone sideways (as shown on the left below). 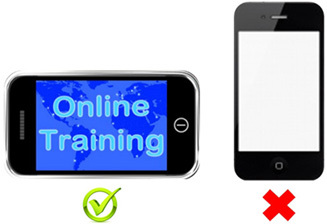 Once the phone has been turned on its side, launch the lesson by clicking on the green play button. Why don’t I have sound/audio? You have to switch browsers. First try Mozilla Firefox, if that doesn’t work try Google Chrome. If this still does not work and you have an Apple/iPhone product, you may try Safari. I watched and completed the video, but why is it not letting me move on? While watching videos, you must wait until the video tab tells you it is done. If you hit the close tab before the last second of the video has played out, it will not be marked 'complete'. If it still doesn’t show completed and you have watched every last second, send us a Help Request. How do I re-print my certificate? Login and navigate to the tab labeled ‘Transcript.’ From there, scroll down the page a little and look for an icon to print your certificate. Copyright © 2016 10DollarFoodCard.com. All Rights Reserved.